Mission: To share our success and help other healthcare professionals achieve the level of success they deserve, based on the experience of an ex-diabetic engineer and author of the top-selling book "Death to Diabetes". Which Training Kit Is Best for You? The Death to Diabetes® Educational Training Program provides 4 different training kits, depending on your specific needs, skills, background and business goals. As depicted in the chart (below), there are two smaller training kits (#1 and #2) and two larger training kits (#3 and #4). Note: The "X"s in the columns of the chart indicate the specific items that are included with each of the four kits. Note: For a more detailed chart of the items in each kit (including the price of each kit), refer to the online store or the chart at the end of this post. 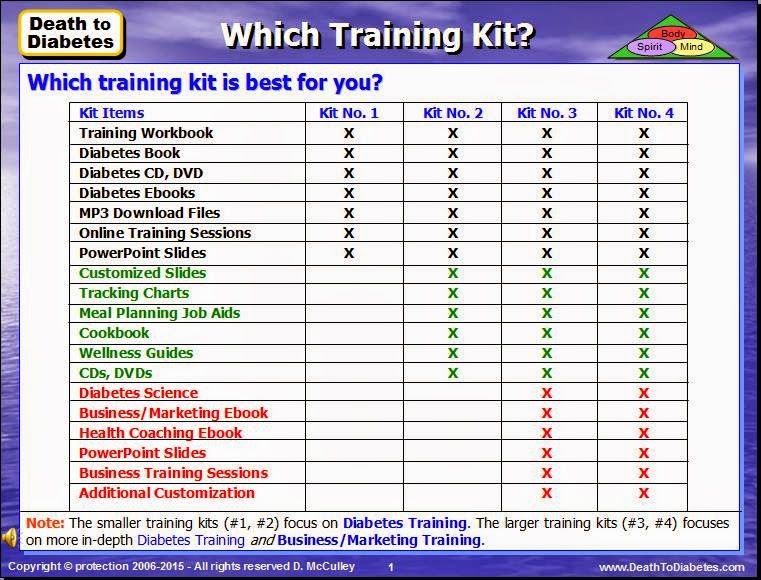 In general, if you already have a health coaching or similar business and you're looking to provide coaching to diabetics, then, we recommend that you get Training Kit #1 or #2. 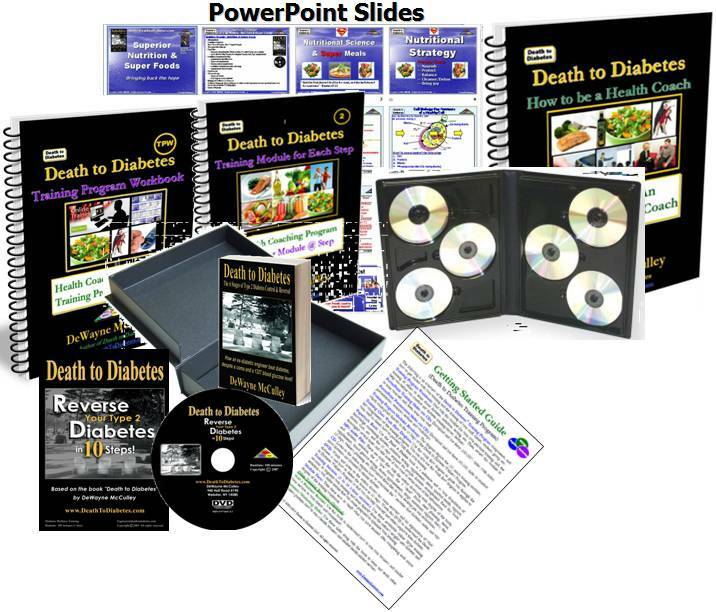 If you feel that you want to learn even more about the science of diabetes; or, if you feel that you need help with growing and marketing your business, then, we recommend that you get Training Kit #3 or #4. 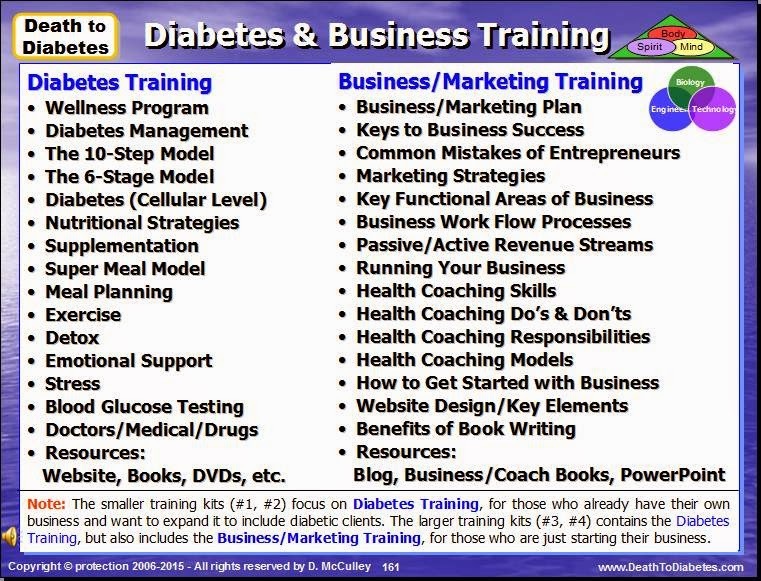 If you are just starting out with health coaching and you need help with learning about diabetes and about starting your business, then, we recommend that you get Training Kit #3 or #4. If finances are a concern, then, start with Training Kit #1 or #2 -- although, in the long run, Training Kit #3 or #4 is more cost-effective because you receive a lot more PowerPoint Slides and a lot more 1-on-1 personal training and business consulting. If you're still not sure if you need the business/marketing training, just answer the following questions. If you answer "No" to more than 3 questions, then, you probably need the business/marketing training. -- Do you have a business/marketing plan focused on diabetes? -- Does your business/marketing plan include the 6-7 key components of an effective plan? -- Do you use multiple marketing strategies to market and promote your business? -- Do you know how to soft-sell versus hard-sell? -- Does your website align with your business/marketing plan and discuss diabetes? -- Do you take advantage of the free Internet tools and platforms to market your business? -- Do you use any of these free Internet tools and platforms to generate revenue for your business? -- Does your business generate both active income and passive income? -- Does your business provide both products and services to your customers? -- Do you use social media sites to market and promote your business? -- Do you use a blog (along with your website) to promote your business? -- Do you have a work process and business model in place for your business? -- Does your bio explain to diabetics why they should come to you for help? -- Do you have an elevator speech? -- Do you understand the psyche of a diabetic and how to empathize with them? -- Do you understand the 5 stages of behavioral change? 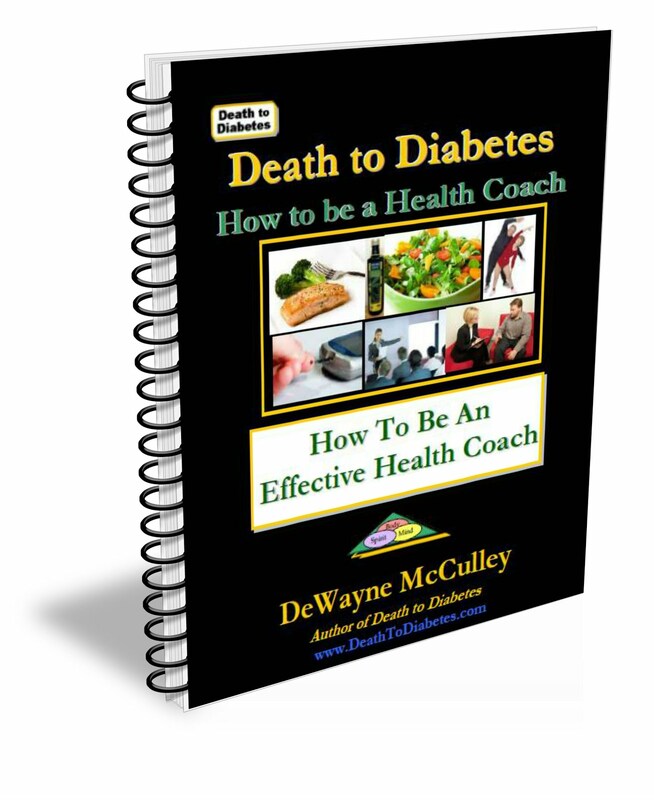 -- Do you have the tools to establish your credibility as a diabetes health coach? FYI: This program is a self-paced online training program with a physical training kit that provides training modules, module tests, CDs, DVDs, and 1-on-1 coaching to help healthcare professionals increase their level of knowledge and expertise to become health coaches, which, in turn, will allow them to grow their business and increase their revenues.The training kit also includes downloads for mp3 files, ebooks, slides, etc. Getting Started Guide & Roadmap: Explains how to use the training kit components. Student Handout: Provides overview of program for the clients in your class. 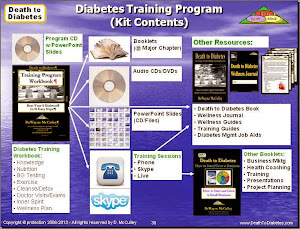 Training Booklet: Provides training questions, learning exercises and action plans, to learn about diabetes, wellness, nutrition, detox, and the 10 steps of the wellness program. Death to Diabetes Book: explains the science of diabetes and how to control and reverse the disease with multiple therapies. CD: Explains the common mistakes that diabetics make and how to avoid them. 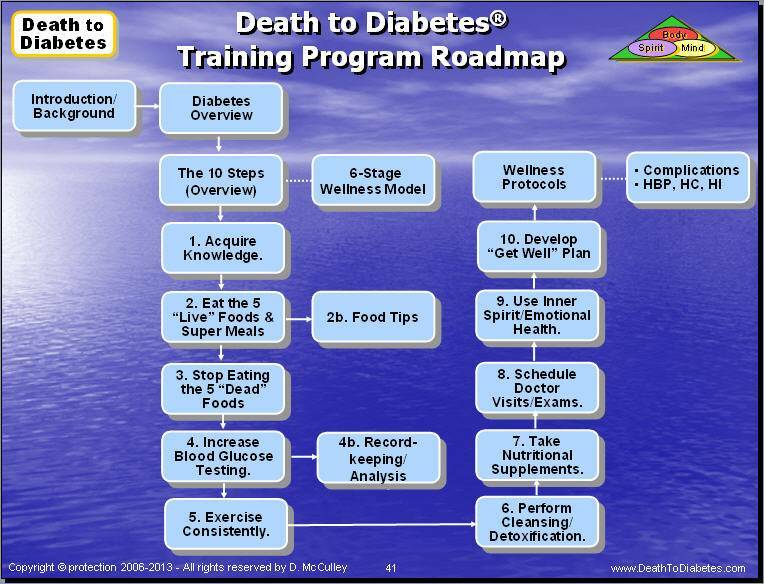 DVD: Explains the 10 steps of the diabetes wellness program. PowerPoint Presentation Slides (50 - 250): Explains diabetes, nutrition, detox, exercise, and other areas of program. Training Sessions (3 - 15): Provides 1-hour training sessions via telephone/Internet for marketing, business, nutrition, diabetes, etc. Train-the-Trainer Program Booklet: Explains how to train your clients and staff to learn how to reverse diabetes w/program. Criterion Test: To verify what you’ve learned. Activity Planning Chart: Provides a list of the specific activities that a diabetic must perform each day, based on the program’s 10 steps. Meal Planning Guide: Provides a meal plan of a breakfast, lunch, dinner, and snack for a day. Cookbook (400 pages): Explains how to design meals to stabilize blood glucose, insulin levels; provides 250+ recipes for super meals, juicing, smoothies, snacks and eating out. Meal Planning Tool Kit: Folder of training aids for diabetes management and meal planning. Wellness Guides (9): Training aids for glucose testing, meal planning, dr. visits/tests, weight loss, blood pressure, kidneys, nerves, heart. Module Training Booklets (10): A booklet for each of the 10 Steps of the wellness program. Meal Planning Booklet: Provides a meal plan of breakfast, lunch, dinner, & snack for 90 days. Activity Tracking Workbooks (3): A journal for tracking daily activities for 30 days. Death to Diabetes Printed Ebook: explains the science of diabetes and how to control and reverse the disease with multiple therapies. Power of Juicing Book: Explains how to juice, the best juicers; 100+ juicing and smoothie recipes for diabetes, high blood pressure, high cholesterol, etc. Training Modules with Criterion Testing (10): To verify what you have learned. Health Coaching Booklet: Explains how to be an effective health coach. How to Start a Business Booklet: Explains business/marketing strategies, how to develop a business plan, how to start/grow business, how to design your website, and write a book. Additional Components (1 - 3): Weight Loss Book, Tracking Charts, Customized PowerPoint Slides w/ Your Company's Header, Add’l Training Sessions. Note 1: This training program is a physical kit that comes to your house -- it consists of 1-3 boxes, with books, booklets, CDs, DVDs, PowerPoint slides, etc. The training program also includes an online component via the phone and/or Skype -- that provides personal 1-on-1 training to you from the author. The program also includes ebooks and other online tools and job aids that can be downloaded to your computer. Note 2: Here is the store link to the training program in our online store. Contact our office for a bulk rate discount if you plan to purchase multiple training kits. Note 3: This training program is also available strictly as a set of downloads without the physical boxes at a cost that is at least 50% less than the cost of the physical kit. Like Us and submit your name/email to get free ebook.